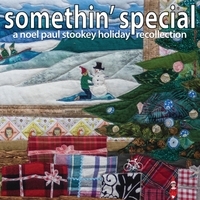 Noel Paul Stookey’s new 12 song Holiday CD, “Somethin’ Special” musically recalls his childhood, his Christmas-time performances with Peter, Paul & Mary and an ever evolving appreciation of the expression and reason for the holiday: the birth of Christ. This cd contains 12 tunes featuring some newer versions of previously recorded tunes, some new arrangements of classic holiday songs and some pieces created recently in the spirit of the holiday season. A 'recollection' can be a distant memory - suddenly recalled - or in this instance, a gathering of childhood stories unique to the Holidays. Some are highly personal, some are musical remembrances of Christmases in concert with Peter, Paul and Mary, but most of the songs reflect an evolving appreciation of the reason for the holiday: the birth of Christ. Michael McInnis - keyboards, synthesizer, production and mixing on EMMANUEL and A'SOALIN, Michael Burd - acoustic & electric bass, Edward Martin Mottau - drums, David Ellis - drums and percussion, Eddie Mottau - co-producer, Bob Milstein - co-producer and quality control, John Stuart - co-producer, recording and mixing engineer @ Houndog Studios, Glenn Barratt - Mastering at Morningstar Studios, Bruce Bennett- Nuts & Bolts @ Next Day Discs, Sally Farr - photographer, graphic design, bicycle and inspired elf. Nora Flanagan & Bluebird Design - quilted cover, Joyce Hall - financial and encouragement coordinator. David Snyder - video, logistics and archivist, SPECIAL THANKS to Betty, the music of my heart, and our daughters Liz, Kate and Anna who continue to add their beautiful harmonies.